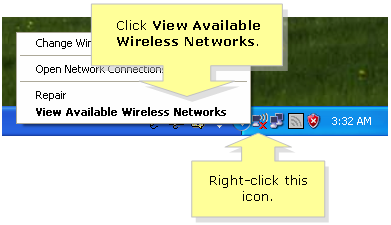 Wireless Zero Configuration (WZC) is a utility that is included upon the installation of Microsoft Windows XP and later operating systems in your computer. This is an alternative way to connect your wireless computer to the network in the absence of a wireless network utility from the manufacturer of your computer. QUICK TIP: WZC also called Wireless Auto Configuration or WLAN AutoConfig. To learn how to check the wireless settings of your Linksys router, click here. If you are using a non-Linksys router, refer to your router’s manual or documentation for details. NOTE: This article assumes that your Linksys wireless adapter is installed properly. Right-click the icon located at the bottom right corner of the screen and select View Available Wireless Networks. NOTE: If Wireless Zero Configuration (WZC) is disabled or another wireless network utility is running, the wireless network connection icon will not appear at the bottom right corner. To enable WZC on the computer, contact Microsoft or consult the computer manufacturer. Select your wireless network name (SSID) and click Connect. NOTE: If the wireless network name (SSID) is not in the list, the SSID broadcast on the router might be disabled. To learn how to connect to the wireless network with SSID broadcast disabled, click here. If the computer is not detecting any signal or is not seeing any wireless network, click Refresh network list. If you still cannot view your wireless network, the wireless switch of your computer may be disabled. If you don’t know where the wireless switch is located refer to your computer’s documentation or manual. You may also contact your computer’s manufacturer. Enter and confirm your network key or password when prompted, then click on Connect. NOTE: If you received an error message while connecting to the network, make sure that you enter the correct password. The network key or password is case sensitive.